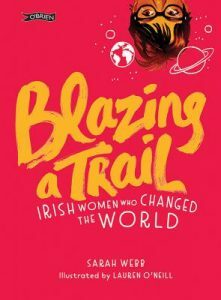 “Blazing a Trail” by Sarah Webb is an amazing, inspirational book that consists of great illustrations by Lauren O’Neill. I’d recommend this book for children 11 years and above. The book consists of Irish Women who revolutionised the rights for us girls and women today and the occupations they worked in. Their occupations range from ground-breaking teachers (Anne Sullivan) to daring surgeons (Dr James Barry) to Suffragettes, nationalist and human-rights campaigners (Hanna Sheehy Skeffington) to fashion designers and businesswomen (Sybil Connolly). The chapters each consist of one women. There are 36 women mentioned including “Blazing a Trail into the Future” which consists of eight women from the twenty-first century. The book covers from c.1530 with Granuaile (also known as Grave O’Malley or Gráinne Ní Mháille) who was a clan leader and sea captain, to 1944 with Mary Robinson, Ireland’s first female president (not including the women from the twenty-first century). “At school I was taught that men were the history makers, the doctors, the artists, the scientists. Later, when I was older, I discovered that this simply was not true. I wanted to shine a light on some of the amazing female Irish pioneers”. This shows that she wants young girls and boys, even older, need to learn about the female figures in history, not just male figures. My favourite quote is “Pray for the dead and fight like hell for the living” from Mother Jones, a Labour organiser and champion of child workers, “Children require guidance and sympathy for more than instruction” from Anne Sullivan, a ground-breaking teacher and “It’s harder to live for a cause than to die for it” from Hanna Sheehy Skeffington, a suffragette, nationalist and human-rights campaigner. In my opinion, I give this book four and a half stars out of five. I gave it four and a half stars as although I loved reading it and the illustrations by Lauren O’Neill were amazing, I would have appreciated more information of “Blazing a Trail into the Future” as it would be good for girls or boys to have a modern role model in the twenty-first century rather than ones in the past. 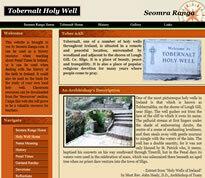 “Blazing a Trail” is an illustrated non-fiction novel on Irish female figures who had a good impact on society. With brilliant illustrations by Lauren O’Neill, winner of the Children’s Books Ireland Honour Award for illustrating 2016. I would highly recommend this book for anyone aged 12 and above, due to the chapters being easy to read and the appealing way its written keeps the reader interested and likely to inspire younger generations to pursue their ambitions, much like the women mentioned in the book. As Sarah Webb mentions on the blurb, the book speaks about women with ambitions and goals to become anything from record breaking runners to rebel leaders. My favourite quotes from this book are from an incredible Suffragette and human rights campaigner Hanna Skeffington, who said “It’s harder to live for a cause than to die for it” and Actor and business woman Maureen O’Hara who said “I have acted, punched, swash-buckled and shot my way through an absurdly masculine profession…I made my mark on my own terms. To conclude my review, I would give this book a four and a half star rating out of five, although I really enjoyed this book and never got bored I would have liked to see some more modern female Irish inspirations mentioned in the book. Overall an amazing book that I think everyone should read.